Description: Students often need these simple reminders when using their Apple iPad in the classroom. 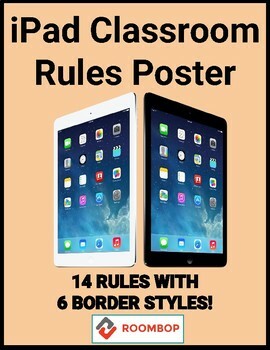 This product contains a cover page as well as 14 classroom rule posters. The cover page and 14 rules come with 6 different border styles. These posters are great for a bulletin board or to fill in space around your classroom. Use all or just the ones that apply to your students. Print out and use the rules that apply to your class. If you want any additional rules added, don't be shy to request them.